Hungarian PM Viktor Orban. Flickr/EPP. Some rights reserved. “Hungary’s Mussolini Vows to Make the EU Member an Illiberal State”, titles Newsweek. Hungarian prime minister Viktor Orban has finally come in the open. At a recent rally of party supporters he has admitted that he is out to turn the country into an illiberal state. He pointed out that liberal western democracies cannot remain globally competitive, and that China, Russia, and Turkey should be taken as the example to follow. These worrying statements are, unfortunately, backed up by facts. They follow years of increasingly restrictive laws in Hungary, which have endangered the independence of the judiciary, the media, and civil society, and entrenched the power of the ruling party, Fidesz. In April 2011 a constitutional reform silenced the constitutional court, allowing the government to pass any legislation it sees fit. In the same year a draconian media reform placed public and private media under state tutelage, eventually leading to widespread manipulation in public broadcasting, direct censorship and closure of opposition media, and attempts to bankrupt international TV channel RLT for its criticism of the regime. 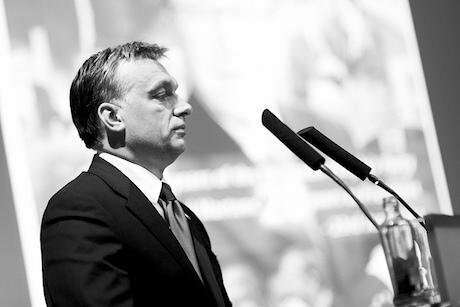 As a result fear has returned to Hungarian society. Relatives and friends of opposition figures became unemployable, a number of NGOs receiving foreign aid were blacklisted, and international donors such as the Norwegian Civil Fund threatened with suspension of their operating license. International institutions have been increasingly vocal. The Council of Europe has written to the Hungarian Prime Minister to share its concern over the NGO audit. And the OSCE, after having already attacked the new media law, demonstrated in a recently published report that media coverage shows “significant bias” towards the ruling party. Concrete action must follow these words. The EU has the tools to act and demonstrate that a suspension of democracy will not be tolerated. Article 7 of the Treaty of the European Union establishes a prevention mechanism in the event of a risk of a breach of common values of the Union by a Member State, and a penalty mechanism in the event of an actual breach. Penalties include suspension of voting rights in the European Council, freezing of structural funds to the country, and if worse comes to worst expulsion from the Union. The Article 7 procedure should be activated now. With Hungary heavily dependent on EU structural funds with 97% of investment project requiring EU support, the mere threat of suspension would send a strong message to Viktor Orban. It would show the Hungarian citizens, frightened by the authoritarian regime, that they will not be left alone. And it would send a message to Europe's neighbours - be it Turkey’s Erdogan or the government of Azerbaijan - that the bloc is not willing to tolerate an erosion of democratic standards. To avoid that a situation such as Hungary’s develops again, Europe must also act to put in place greater protection of fundamental rights. This includes protecting the freedom and pluralism of Europe’s media. Nearly 200,000 people have already signed a European Citizens Initiative demanding an EU Directive to protect the independence of the press across the continent. This demand should be taken up by the European Commission, and a draft legislation should be produced immediately. Europe is the cradle of democracy. It is now up to the European institutions to demonstrate that this continent will stand up and do what it takes to defend it.